Royal Canin Maxi Ageing 8+ is tailored to meet the specific nutritional needs of large breed dogs over eight years old, ensuring they remain healthy and happy. It’s a complete mix chosen to help boost your dog’s defences against the common problems of getting older. The base ingredients include poultry protein, rice, maize, minerals, and vegetable fibres, among others. These provide a wide-ranging, balanced diet for your dog. The wide flavour profile means they're also sure to love the taste. It is fortified with glucosamine to help to keep your dog’s joints supple and healthy, so they can remain active and playful. The nutrients in the food contribute to a glossy coat, while also maintaining skin health. Green tea and grape extracts deliver antioxidants into your dog’s system. These are key in boosting your dog’s immune system, as well as combating the build-up of free radicals. These can, if left unchecked, attack your dog’s healthy cells. Your dog could then be at further risk of serious illnesses, such as kidney infection. contributes to your dog’s digestive health. As your dog gets older, they will often face a specific set of health challenges. This is especially true for larger breeds, who have a unique set of health risks as it is. Big dogs are heavy and, over time, simply carrying their weight around can potentially cause joint problems. Arthritis, for example, can be common. Supporting your dog’s joints and bones as they mature is therefore fundamental in maintaining a happy, active lifestyle. The older your dog, the more danger they may face from free-radical formation. These harmful molecules can build up over time, but can be mostly neutralised by antioxidants, much the same as in humans. 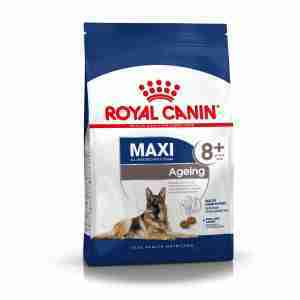 Antioxidants included in a healthy diet, such as Royal Canin Maxi Ageing 8+, can safely manage these build-ups. Ingredients: dehydrated poultry protein, rice, animal fats, wheat, wheat flour,maize, maize gluten, hydrolysed animal proteins, vegetable protein isolate*,beet pulp, vegetable fibres, minerals, fish oil, yeasts, soya oil, tomato(source of lycopene), psyllium husks and seeds, fructo-oligo-saccharides,hydrolysed crustaceans (source of glucosamine), borage oil, green tea and grapeextracts (source of polyphenols), marigold extract (source of lutein),hydrolysed cartilage (source of chondroitin). ADDITIVES (per kg): Nutritionaladditives: Vitamin A: 29300 IU, Vitamin D3: 800 IU, E1 (Iron): 51 mg, E2(Iodine): 5.1 mg, E4 (Copper): 10 mg, E5 (Manganese): 67 mg, E6 (Zinc): 200 mg,E8 (Selenium): 0.11 mg - Preservatives - Antioxidants. ANALYTICAL CONSTITUENTS:Protein: 27% - Fat content: 17% - Crude ash: 5.7% - Crude fibres: 2.7% -EPA/DHA: 4 g/kg. *L.I.P. : protein selected for its very high assimilation. My dog absolutely loves this food. He is 9 now and has eaten Royal Canin for the past 8.5 years. We keep some of this as treats too. Great delivery service from pet Supermarket too. Our nine year old HWV loves Royal Canin . He has been fed on this since he was a puppy and we moved him to the 8+ last year. He has never not eaten his meal and we even use it for his & biscuit treats too. Great service from pet supermarket too delivering the 15kg bags. My border collie is now 8 so I decided to move him to Royal Canin 8+ ageing. He was on the obesity Royal Canin previously which he loved and helped to bring his weight down, however he also loves the ageing food. I will never change him from Royal Canin. I think its a great product and MedicAnimal is a great site to buy from. We have used Royal Canin for most of our dogs life and will continue with it as long as he continues to enjoy his meals. We know he gets and good balanced diet and we only add treats as and when. And we have used Medicanimal.com in the UK for a few years now and love the service and occasional discounts they offer. I would recommend the web site fully; it is a brilliant way to buy food for our pet. My dog won best veteran at our breed show and with it a pack of Royal Canin. He loves it. Twice he has opened a packet himself using his teeth and claws, The first time he did it he ate half of the 3 kg bag before we noticed he had let himself in the utility room where his food is stored!